Shiloh Drake and Natasha Warner demonstrate linguistics activities to Magellan Circle members at a Magellan reception. Congratulations to Wunetu Tarrant, NAMA student, on becoming the Bloch Fellow at the upcoming LSA Institute! Neda Maghbouleh, 2019 Taleghani Lecture Series Speaker, delivered a talk based on her 2017 book: The Limits of Whiteness. The 2019 Dr. Taleghani Endowment Fellow, Faezeh Faezipour with Dr. Simin Karimi. Noam Chomsky gave a talk on Language Architecture and Evolution, as a Cognitive Science colloquium. Undergraduate Aivry Eastman having fun with syntactic ambiguity at Tucson Festival of Books 2019. Ofelia Zepeda and a student from her Tohono O’odham course at the UA language fair. At Tucson Festival of Books 2019, graduate student Shannon Grippando shows one way to learn that language is left-lateralized. Graduate student Flo Hafner recording a name with Praat at Tucson Festival of Books 2019. Graduate student Donovan Pete giving Navajo lessons at Tucson Festival of Books 2019. Graduate student Angela Hughes explaining ultrasounds at Tucson Festival of Books 2019. Society for the Study of the Indigenous Languages of the Americas (SSILA), where the project Amy Fountain worked with was awarded the 2019 Ken Hale Prize. The project name is the Coeur d’Alene Online Language Resource Center. The people in the photo are, left to right:Cheffrey Sailto, Coeur d’Alene Language ProgramsJohn Ivens, University of Arizona,Prof. Amy Fountain,Shannon Bischoff, Purdue University Fort Wayne,Audra Vincent, Coeur d’Alene Language Programs, John Lyon, CSU Fresno Michelle Clark, Coeur d’Alene Language Programs. Valeria, and Lila Gleitman at a workshop in honor of Noam's 90th birthday. Stanley Donahoo, doctoral candidate in Linguistics (Cognitive Science GIDP minor) recently presented at the fourth International Conference of the American Pragmatics Association, Donahoo’s presentation, entitled “Experimental evidence for defining the semantic representation of expressive content” spoke to effects induced when comprehending swear words. Based on the merits of the submitted abstract, Donahoo was selected for a Graduate Student Travel Award by the scientific committee of the conference. Wilson Silva, Megan Harvey and Robert Henderson at the Sound System of Latin America 3 Conference at the University of Massachusetts in Amherst. Thank you to the professors and graduate students that presented at the Sonoran Science Academy during an outreach school visit. Outreach committee member Donovan Pete speaks to students during the Sonoran Science Academy school visit. Professor Sandiway Fong presented at the Sonoran Science Academey during one of the school vistis for outreach. ANLI student, Christina Laree Newhall, interned at the Smithsonian in Washington D.C. over summer 2018 and assisted in making guides intended to support language revitalization projects. The project's aim is to create language specific guides for navigating the National Anthropological Archives, whereby making archived materials related to languages of Native North America and original people of Mexico, more accessible to Native American researchers involved in language and cultural revitalization efforts, and to support archival projects like Breath of Life Institute and Rising Voices. On August 1 and 2, three members of the Coeur d’Alene Tribal Language Programs (program manager Audra Vincent and colleagues Michelle Clark and Cheffrey Sailto) visited the UA in order to meet with AILDI program coordinator Alyce Sadongei and director Ofelia Zepeda, as well as the Coeur d’Alene Online Language Resource Center technical team (John Ivens, technical lead, UA undergraduate Timothy Chartier), and co-PIs Shannon Bischoff (Purdue University Fort Wayne) and Amy Fountain (UA) to plan work funded by the National Endowment for the Humanities under the Documenting Endangered Languages program (Award PD-261031-18). Genesis Hernandez, B.A. graduate of the Department of Linguistics (2017), presented a poster at the Acoustical Society of American Meeting in Minneapolis. Natasha Warner worked with Peter Nelson (Coast Miwok and San Diego State University) on language revitalization for Coast Miwok at the Breath of Life workshop at University of California Berkeley. Current UA student Seongjin Park, UA alumni Jae-Hyun Sung and Gwanhi Yun, and Natasha Warner presented posters and talks at the Hanyang International Symposium on Phonetics and Cognitive Sciences of Language in Seoul, Korea. Maureen Hoffmann and John Culnan presented posters at the Acoustical Society of America Meeting in Minneapolis. University of Hong Kong Fulbright Scholar Suki Yiu presented her research on Metrical and Tonal Prominence in Swatow at the 6th International Symposium on Tonal Aspects of Languages in Berlin, Germany during her 6-month stay in the University of Arizona Department of Linguistics. Linguistics Professor Andrew Carnie, Linguistics Research Scientist Muriel Fisher, and Professor of English Meg Lota Brown lead a study abroad tour to Scotland this summer. The topic was “The Scottish Enlightenment and Gaelic Culture”. Linguistics majors Grace Johnson and Max Mule were among the participants. Bri Alexander presented at the Cherokee Nation Community and Cultural Outreach's Annual Conference of Community Leaders in Tahlequah, OK. In the pic, from left to right, is: CN's Secretary of State Chuck Hoskin, Jr., CN's Deputy Chief Joe Crittenden, CN's Master-Apprentice Program Head Howard Paden, Bri Alexander (co-presenter), CN's Principal Chief Bill John Baker, and Carey Flack (co-presenter). Dr. Silva's collaboration team working on the A'ingae, Desano, and Siriano documentation projects at NAMA, U of Arizona. July 9-13, 2018. The department celebrates Spring 2018 graduates with bachelor's, masters and doctoral degrees across NAMA, HLT and the Linguistics Ph.D. programs. Congratulations to all of you! Eighth Annual Taleghani committee and 2018 Fellow Alyeh Mehin Jafarabadi. Current and former UA linguists Jeff Punske, Samantha Wray, Amy LaCross, Nick Kloehn, Adam King, Shiloh Drake and Adam Ussishkin at the University of Kentucky for the Workshop on Morphological Typology and Linguistic Cognition, funded by NSF grant to Andrea Sims (OSU) and Adam Ussishkin. "Mutsun community members and tribal chair Val Lopez in San Juan Bautista, California, with UA linguist Natasha Warner, learning to use the new Mutsun dictionary. Picture by Frank Perez." "Mutsun community members in San Juan Bautista, California, with UA linguist Natasha Warner, learning to use the new Mutsun dictionary. Picture by Frank Perez". "Mutsun community members in San Juan Bautista, California, with UA linguist Natahsa Warner, learning to use the new Mutsun dictionary. Picture by Frank Perez". "Andrew Carnie, Diane Ohala, Mike Hammond, Muriel Fisher and Andrea Fulgham in Scotland on the way to research sites in Bangor, Wales, and Skye, Scotland." The department celebrates the Spring 2017 graduates with bachelor's, master's, and doctoral degrees across ANLI, NAMA, HLT, and the Linguistics Ph.D. programs. The last session of the elicitation class with Daban Mamood, the Sorani language consultant. Massumeh Farhad gave the Department of Linguistics' 7th Annual Teleghani Lecture on "When Paintings Speak: The Shahnama of Shah Tahmasp and Its Inscriptions"
Interested? Click here for more information, and click here to apply! Rebecca Sheley, a student in Diane Ohala's Intro to Linguistics class, participating in PhD student Sam Johnston's ultrasound demonstration. Graduate students Rachel Brown, Leah Rice, Stanley Donahoo and Shannon Grippando at the Core dEEG Skills course run by EGI in Summer 2015. PhD student Keisha Josephs and her colleague Sheldon Noel are helping to support revitalization efforts for the Lokono language in Guyana. Check out the article on the Guyana Chronicle (link) for more details! Dane Bell putting an EEG net on Rachel Brown for an experiment. Check out the Daily Wildcat article on some of the department's recent research here. Ryan Smith, Stanley Donahoo, Megan Figueroa and Skye Anderson at the LSA's 2015 Linguistic Summer Institute. More information on the institute here. Aildi students playing a lenape game. Aildi students playing morphology game. Muriel Fisher describing traditional fishing in the bay at Gleann Dàil, Isle of Skye to Ian Clayton. Click here for more info about the field work. Congratulations to our Spring 2015 graduates! More information here. Congrats to Joshua Meyer and Melodie Yen who are recipients of the NSF graduate fellowship! More info here! Photo courtesy of LSA website. Congratulations to Adam Ussishkin, Andy Wedel, Samantha Wray, and Shiloh Drake, who have all had papers accepted to the upcoming 5th International Conference on Maltese Linguistics. More information on the June 24-26 conference at the University of Torino in Italy can be found here. "The Science of Language" summer camp was held by the Department of Linguistics from June 1-5, 2015. Click here for more information! Maria Florez Leyva doing transcription of Hiaki audio files. Spring 2015 graduate Patricia Ogunmola working on an independent study with Dr. Diane Ohala. Robert Henderson meeting with the members of Kaqchikel Cholchi', the governing body of the Kaqchikel language. Graduate students Shiloh Drake and Noah Nelson at Tucson Festival of Books on March 16, 2014. Visitors to our exhibit used a finger-tapper to see that language is left-lateralized. Robert Henderson to join the UA Linguistics Department in Fall 2015! For more information click here! 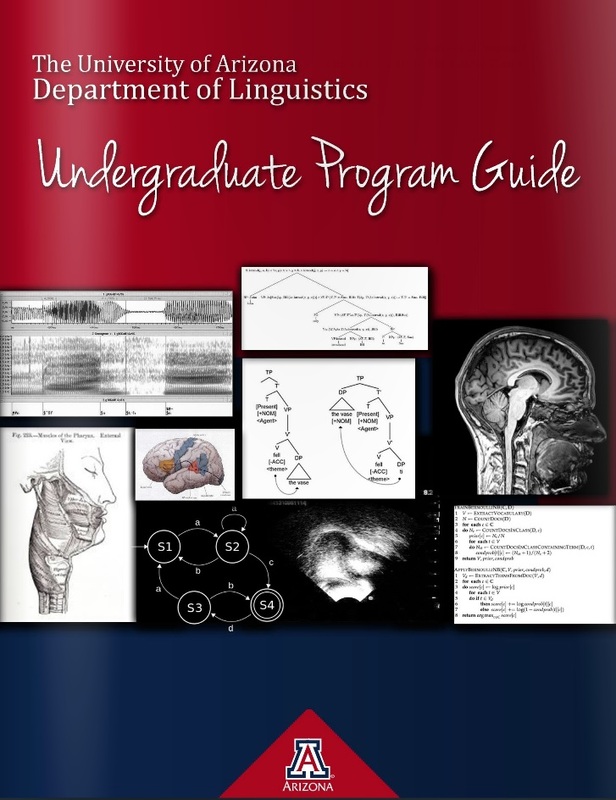 The Department of Linguistics at the University of Arizona offers undergraduate and graduate programs in linguistics and human language technology. Our faculty has research specializations in phonetics, phonology, morphology, syntax, semantics, computational linguistics, psycholinguistics, language acquisition, and biolinguistics, represented by diverse interests in a variety of languages. We also offer unique programs in Native American linguistics. The department trains students for careers in teaching, research, and industry, and is equipped with a variety of laboratory facilities. Learn about programs, careers, graduate school and more through our Digital Brochures!